Professional Vista FAT file system recovery software recovers all virus infected data documents like songs, music, pictures, images, Microsoft word, excel documents from all crashed or formatted hard disk storage devices. VFAT partition volume retrieval utility rescue lost or corrupted dos boot records, MBR, MFT, root directory information from SCSI IDE SATA disk storage devices that have been lost due to reinstalling of operating system. ...... Laptop hard disk FAT recovery program retrieve lost data from hard drive, compact flash, zip, USB drives and supports all FAT, VFAT, FAT12, FAT16, FAT32 file system. 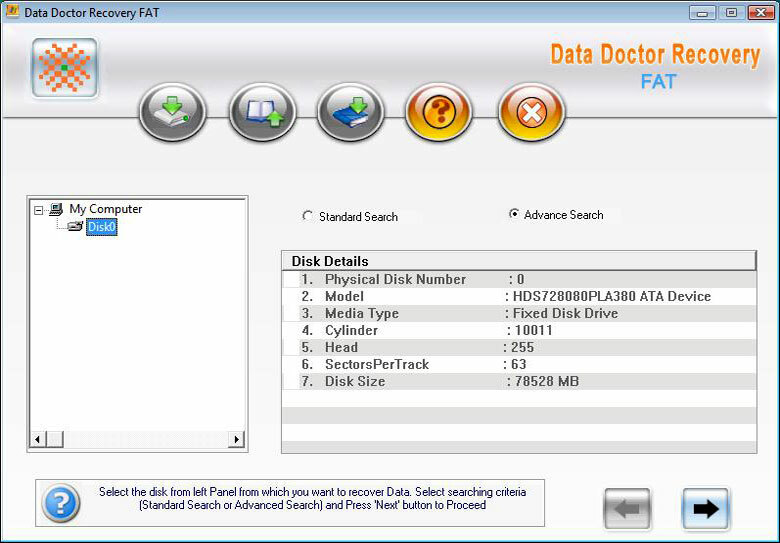 Easy windows FAT data recovery software revive your lost or corrupted hard drive information such as master boot records, DBR, MFT, root directory from crash disk drive. FAT data recovery software recover formatted drives files and documents without any changes even after reinstalling operating system, repartitioned hard drive, missing or lost logical drives. Notebook windows FAT data restoration program has the ability to revive your lost data in all situations such as missing files and directories, inaccessible hard drive, drive is not booting etc. * Recover your lost data even when drive is not formatted messages is displayed by your computer system. * Restore corrupted root directory, master boot records, DBR, MFT etc. Restores deleted application program files and office documents. Qweas is providing links to Windows XP FAT Recovery Tool 3.0.1.5 as a courtesy, and makes no representations regarding Windows XP FAT Recovery Tool or any other applications or any information related thereto. Any questions, complaints or claims regarding this application Windows XP FAT Recovery Tool 3.0.1.5 must be directed to the appropriate software vendor. You may click the publisher link of Windows XP FAT Recovery Tool on the top of this page to get more details about the vendor.